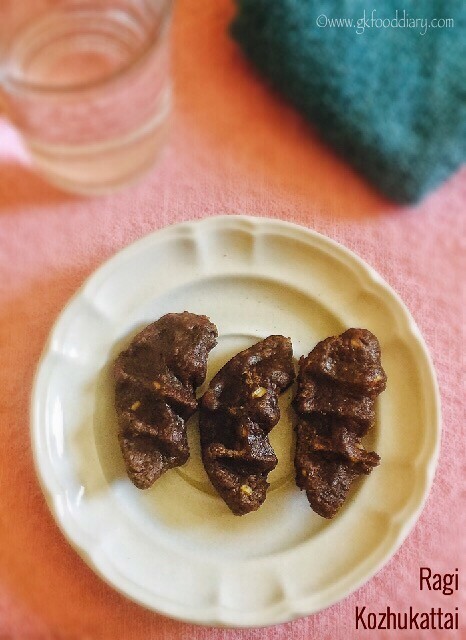 Ragi Kozhukattai – healthy steamed ragi dumplings made with jaggery, best snack for kids! It’s very simple to make but tastes delicious and nutritious too. Ragi Kozhukattai is an excellent way to include the healthy millet Ragi in kids diet. 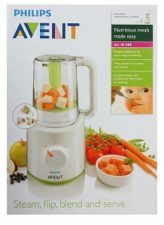 This is an ideal snack for babies after one year. Check more ragi recipes here if you are interested. Keep all the ingredients ready. Boil moong dal in a saucepan until its half cooked. 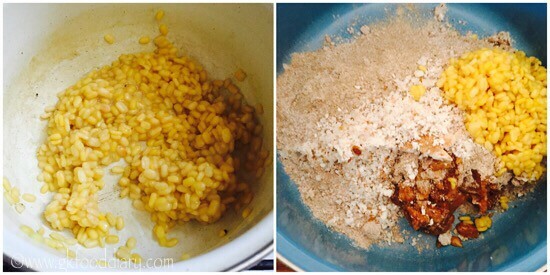 Heat a pan and dry roast the ragi flour for 5 minutes in low flame or until its hot to touch. Don't burn it while roasting. Set aside. Heat water in a pan until rollling boil and switch off the flame once done. 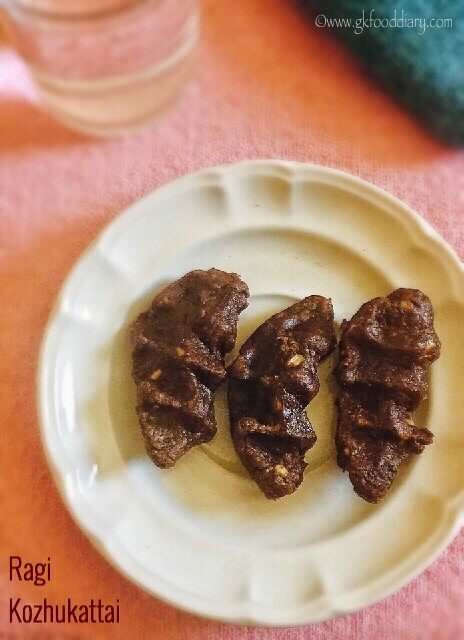 Take the dry roasted ragi flour, boiled moong dal, jaggery powder, grated coconut, cardamom and salt in a wide plate and sprinkle the warm water on it and wet the entire flour. Keep mixing with water until you could able to form a smooth dough. Then divide the dough into equal sized balls. Keep each ball into your hands and press it to bring an oblong shaped dumplings. Grease each dumpling with little ghee. Transfer the dumplings to a muslin cloth and spread over it. Place it on a Idli steamer plate and steam it for 15 minutes with a cup of water. Switch off the flame once done. The Kozhukattais will turn shiny once its cooked. 1. Keep all the ingredients ready. 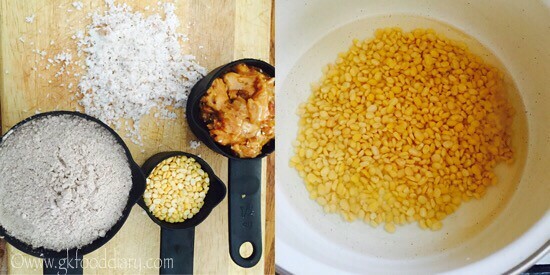 Boil moong dal in a saucepan until its half cooked. 2. 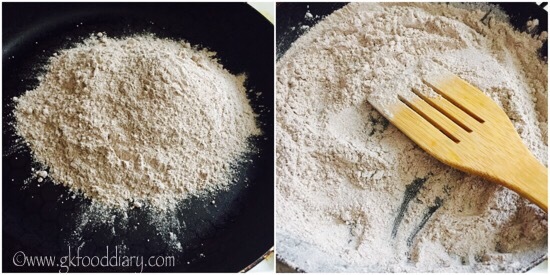 Heat a pan and dry roast the ragi flour for 5 minutes in low flame or until its hot to touch. Don’t burn it while roasting. Set aside. 3. Heat water in a pan until rolling boil and switch off the flame once done. 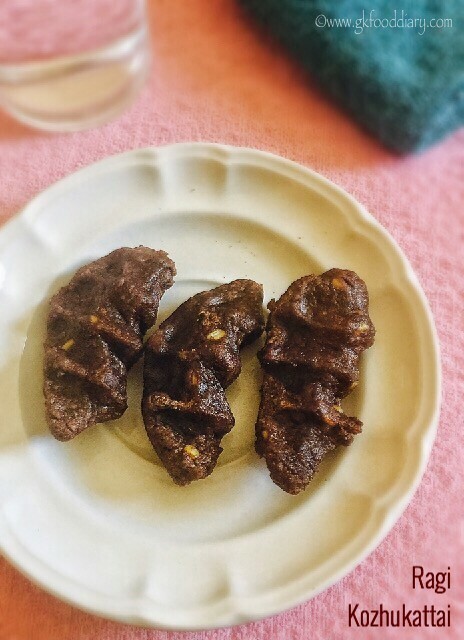 Take the dry roasted ragi flour, boiled moong dal, jaggery powder, grated coconut, cardamom and salt in a wide plate and sprinkle the warm water on it and wet the entire flour. 4. Keep mixing with water until you could able to form a smooth dough. Then divide the dough into equal sized balls. 5. Keep each ball into your hands and press it to bring an oblong shaped dumplings. Grease each dumpling with little ghee. 6. Transfer the dumplings to a muslin cloth and spread over it. Place it on a Idli steamer plate and steam it for 15 minutes with a cup of water. Switch off the flame once done. The Kozhukattais will turn shiny once its cooked. 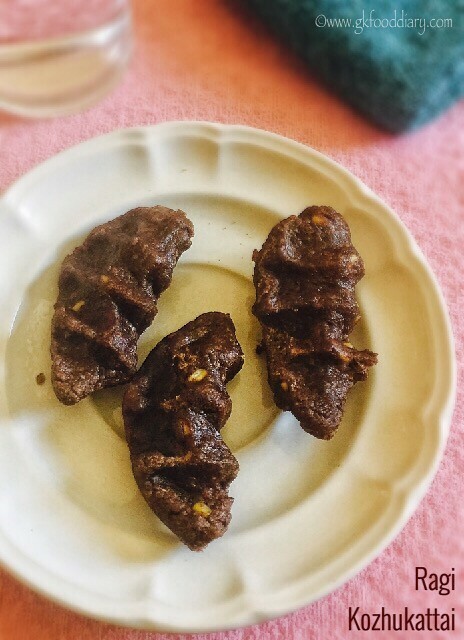 Serve the ragi Kozhukattai warm. 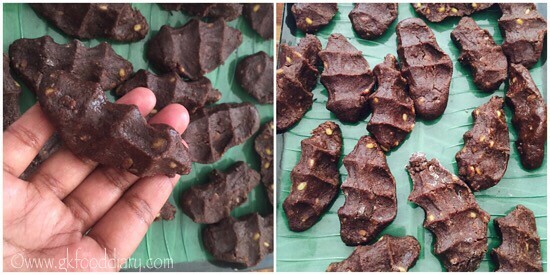 I used homemade sprouted ragi flour for making kozhukattai, you could use store bought ragi flour too. 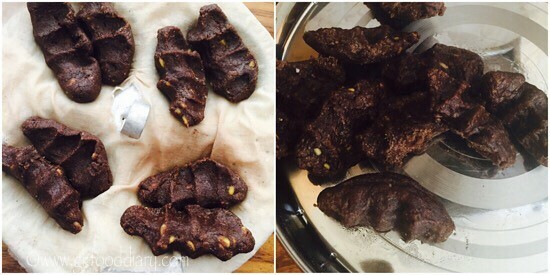 This ragi kozhukattai tastes best when served immediately. It might get hardens after a while. 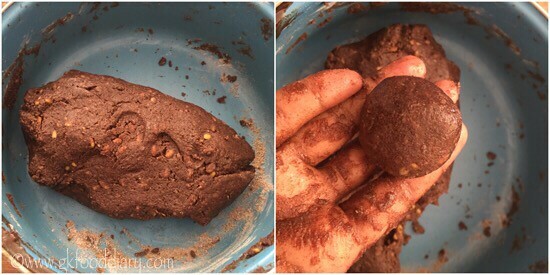 Try this ragi puttu to your baby after introducing ragi separate. Generally ragi doesn’t cause any allergies, but check for symptoms and stop feeding your baby if you find any.